Whether you’re impressing your friends at a Friday night dinner party, or fuelling your family on a Sunday afternoon, it’s important to make sure you have the very best dinnerware on hand to help keep up appearances! The last thing you want when hosting an extravagant meal is mismatching knives and forks and old, worn-out crockery full of chips and scratches. And remember, Christmas will soon be upon us, so why not prepare for your mega festive meal early? Don’t be scrabbling around for emergency plates and forks on the day! 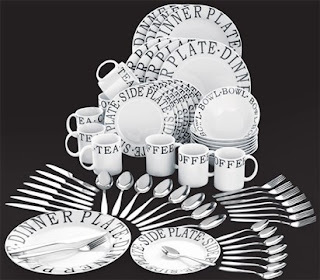 At Studio, we stock a huge selection of dinner and cutlery sets in various styles to suit a range of kitchen decors. So whether you’re looking for a simple and contemporary set or perhaps something more rustic and traditional, you’re sure to find exactly what you need at Studio. Comprising of 100 pieces of the highest quality cutlery and crockery, this beautiful vintage script dinner set has everything you’ll need to host unforgettable meals and dinner parties. Featuring a classic script design with stylish white and black colouring, this fabulous 100 piece set offers both vintage and contemporary vibes which will complement most kitchens superbly. 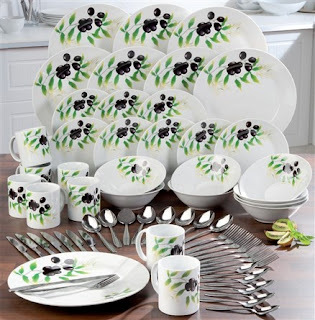 Breathe new life into your kitchen with this charming 64-piece olives dinner set. With a leafy design and soft green and white colouring, it’s sure to bring a rustic, country feel to your kitchen. 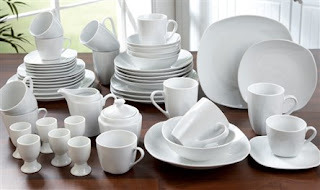 With a simple, but effective white porcelain design, this elegant Aspen dinner set is suitable for all dining occasions. Use it to serve a simple breakfast, or even for a hearty 3-course meal. Bring a touch of the great outdoors to your kitchen with this charmingly stylish birds in bloom dinner set. With 16 pieces of top notch dinnerware, it’s ideal for serving up delicious, homely meals. Plus, when you purchase the black set, you’ll receive the co-ordinating ivory set absolutely free! If you already have a nice selection of plates, bowls and mugs that you don’t wish to part with, then consider just refreshing your cutlery. This stylish 48-piece set is made from hand-polished stainless steel and complements the majority of dinner sets wonderfully.